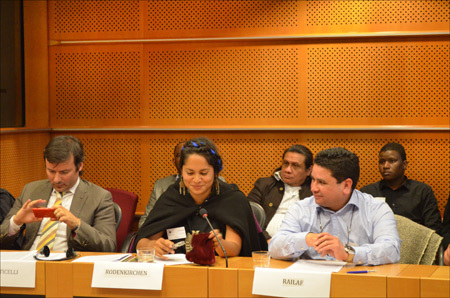 Mapuche: Rafael Railaf at the European Parliaments. International Conference: "Indigenous Peoples - Invisible Peoples"
My name is Rafael Railaf. I am Mapuche and a member of Mapuche Foundation FOLIL. FOLIL has now been active for 15 years and was founded in 2000; shortly after the house arrest of former dictator Augusto Pinochet in London in 1998. Mapuche Foundation FOLIL is one of the first Mapuche organizations in Europe most of its members are first and second generation Mapuche. We focus on human rights, culture, tradition, language and supporting different media (internet, radio and music) concerning the Mapuche people in and outside of Chile. I was born in the Mapuche community of Quetropura, in Lautaro, southern Chile. My family and my parents speak the Mapudungun, which is the Mapuche language. At school I learned Spanish. In that time it was impossible to receive education in Mapudungun. Most Mapuche spoke their own language in their communities and spoke Spanish outside of them. People were afraid to be rejected or discriminated if they spoke Mapudungun. In 1977 our family fled to the Netherlands. There I learned to speak Dutch, English and German, but the Mapuche language was also spoken in our family. Mapudungun means "Language of the land". There are about 1,5 Million Mapuche People in Chile and 35 % of them regularly speak Mapudungun. It is important for a Mapuche to learn and speak his own language, but it is even more important to preserve that language. Language is culture, and if our language becomes extinct, the foundation of the Mapuche culture will disappear. It is obvious that during important cultural events; such as the Ngillatun and the Wetripantu, Mapudungun is spoken. The Ngillatun is the harvest celebration. People ask the great (god) Gnenechen for a good harvest. During the Wetripantu, turn from the old year to the New Year is celebrated. The Machi, a spiritual leader and often a woman, speaks, prays and sings in Mapudungun. Singing is also an important part of the Mapuche culture. Old stories were passed on to the younger generation - from father to son and mother to daughter - through singing so as not to forget their history, just like that of Leftraru (Lautaro in Spanish), one of the most important Mapuche warriors in our history. Peter K. Austin, a professor of linguistics says: “A language is under threat when it threatens to disappear and when there are no speakers left. If a language wants to be healthy, it has to be spoken by children”. So, we advocate for more Mapudungun at schools in Chile. At this moment, some schools in Chile offer Mapudungun classes, but these are mostly temporary projects. Above all, not all of the teachers that teach Mapudungun in schools have a didactic background. There should be more professionally educated teachers, so that the language has a chance to develop on a higher level. As said, language is culture, but land is also a part of Mapuche culture. Mapuche literally means “people of the land”. At this moment, there is an unnecessary territorial conflict going on in Chile. Indigenous Mapuche People are occupying land that traditionally belonged to them. This has been causing conflicts between Chilean farmers or companies and the Mapuche community. The Chilean government has reacted to this harshly with violent raids and this has caused unnecessary injured people in the Mapuche communities. This causes the Mapuche to get into conflicts with the police, after which they end up in prison. Recently, on April 13 2015, the Mapuche community Rankilko in the Malleco area experienced raids. The community build houses on ancestral Mapuche land and has claimed it. The authorities do not agree and so the police was called upon and took excessive action against the people. They used firearms and helicopters to intimidate the people there. The Rankilko community does not think this is the way to solve a political problem. They now say that what happened to the Mapuche people shows a lack of political goodwill on the part of the government. The Rankilko Mapuche community demands the return of Mapuche territory. The community wants legal action to be taken against the use of force by the police to protect the physical, psychological and territorial integrity of the community. Especially against its children. Today, 31 days ago imprisoned Mapuche People in Angol started a new hunger strike. It is part of a series of many hunger strikes that have taken place over the past years. It includes – among others - Miguel Toro Marin and Claudio Huentecol Huentecol, they think their arrest is unjust and believe that the court judgments are questionable. During the legal investigation there were clear indications that Miguel and Claudio’s innocence could be proven, but still the public prosecutor imprisoned them. The communities plead for the demilitarization and decriminalization of their territory and struggle, such as the Winkull Newen community. They have recently started a social networking campaign for support of their community because they are experiencing a new wave of political prosecution. The Mapuche communities feel that the state has started a new attack against them. They have tried to start a dialogue with the state for years, but they have the feeling that the government does not intend to solve the problems relating to territory. They say that the government does not want to speak to people in the Mapuche communities where the conflict is taking place. There are many Mapuche that want to open a dialogue, but this offer has not been taken up. This is not only claimed by the various Mapuche communities. Different national and international organizations have made similar comments. Philip Alson, special rapporteur of the United Nations on extreme poverty and human rights, described the Mapuche situation in Chile during his recent mission, as “the Achilles’ heel of Chile in the application of human rights " and called for urgent and serious adherence to international guidelines. Mapuche Foundation FOLIL advocates more of a focus on the Mapuche language, in relation to human rights, in the European Parliament. The Parliament should give recommendations to the Chilean government regarding the most important point for the Mapuche; their land and their language. - Firstly, the Chilean government should give proper information to the companies that buy Mapuche land through the government, so that these companies know the consequences for the traditional communities. - Secondly, the Chilean government should let the Mapuche community have a say in deciding which land can be sold. - And lastly, the Chilean government should strive for more education in Mapudungun and for professionally educated Mapudugun teachers so they can teach the language to the younger generations in a more efficient way.